The Ramjas College of University of Delhi, and wider campus of the university are under siege. Members of the ABVP, the student group affiliated to RSS, have unleashed an open terror. They attacked a seminar organised by the English Department and Literary Society of the college on 21 February, threw stones on the college conference hall, and physically and verbally attacked students and teachers of the college. The following day, they were even more violent. They held students and teachers of the college hostage by not allowing them to march to the local police station against the previous day's happenings. Violent threats were openly given against two teachers of the college, and like the previous day, students and teachers were abused and threatened. Outside the college, they attacked students and teachers of other colleges and universities of the city, who had gathered in solidarity with students and teachers of the college, and against ABVP violence. Scores received serious injuries. 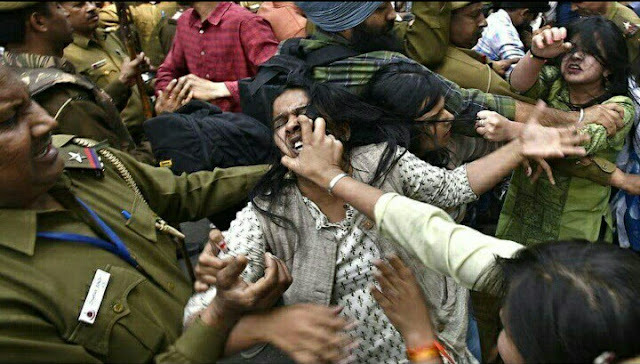 A dangerous low was reached when student members of the ABVP were seen physically attacking their own teachers. Delhi police has acted as a mute agent of ABVP terror. It did not arrest ABVP members when they attacked the Ramjas college seminar, threatened its students and teachers, and assaulted others the next day. In fact, police personnel joined the attackers, and also attacked journalists covering the violence. ABVP violence is the result of careful planning, training, and crucial support from state functionaries of the Modi government, whose Home Ministry directly controls Delhi Police. Unlike other universities like JNU and HCU, which have seen ABVP aggression in recent times, DU has been a centre of ABVP politics for decades. It has won many student union elections. However, this level of violence is unprecedented. It is well known for decades that RSS trains its cadres for visceral hatred and violence against minorities. ABVP members at a place like Delhi University have now also been successfully trained for direct physical assault on other students and teachers. It is a new high for fascist organisational skills of the RSS and BJP. They have a group of storm troopers, ready to terrorise and physically assault in open day light anyone who does not agree with, or opposes, RSS and BJP. A university is a rare space in the caste ridden, patriarchal and communalised society of India, which provides the youth to interact freely with students and teachers of diverse backgrounds, to learn and critically think about diverse aspects of society, and develop as autonomous social agents. Radical social reformers like Phule and Ambedkar had long recognised the importance of modern education for the oppressed, and its potential to challenge existing social hierarchies. The recent expansion of higher education in the country has seen millions of first generation students from oppressed castes, minorities, and women joining universities like DU. The relative openness of a university space allows for radical questioning of hierarchies, and explains why the social environment in universities can be liberal and encourage growth of radical politics. At present, when the state ideology in India has become neoliberal, and an expanding capitalism has created a receptive atmosphere for the rightwing politics, it is precisely radical politics against caste and patriarchy, and the radical left which demands abolition of class rule, which stand most forcefully in the way of the overall subjugation of India under the fascist Hindu Rashtra programme of the RSS and BJP. This also explains why universities are critical for the RSS, and why since the BJP came to power at the Centre it has targeted groups like Ambedkar Periyar Study Circle at IIT Madras, Rohith Vemula's organisation, Ambedkar Students' Association at HCU, JNU, and now students and teachers at Ramjas College and DU who do not agree with them. The most recent case of suspending a member of the faculty at Jodhpur's Jai Narain Vyas University for something as basic as inviting Nivedita Menon for an academic conference exposes the extent of their insecurity well. It needs to be recognised that the RSS/BJP politics is fundamentally different from other forms of authoritarian politics. Its success lies in turning violent authoritarianism into the politics of mass mobilisation. It was worked on for decades on the religious, communal and caste prejudices of Hindus to build an expanding core of supporters. More recently, it has clothed itself in the flag of nationalism to brand its opponents as anti-national. In reality, the Hindu Rashtra of RSS/BJP would be a prison house of hatred and violence against any freedom and equality. It would impose a nationalist test on everyone. It would mobilise Hindus for violence against minorities, oppressed castes and those in Kashmir and the North-East who question the impositions and brutal use of military force by the Indian State there. None of this is being taken lying down and resistance has been growing, whether in the 139-day strike of the students of FTII, the anti-caste movement that emerged in HCU following the institutional murder of Rohith Vemula or the battle that continues to this day in JNU. The confrontation in DU is simultaneously testimony to the fierce resistance offered by the broader university community in rejecting the terror tactics of the ABVP. NSI calls upon the student and teacher community of Delhi University to not be cowed down by this blatant exercise of muscle power by the ABVP. It is an opportunity to think clearly about the actual game plan of the RSS/BJP, and not be taken in by any slogan of false and violent nationalism. Students and teachers of DU need to come together and think of effective ways to counter ABVP terror on campus. All left, progressive and liberal forces in campus need to plan for mobilising the widest sections of students, who wish to use opportunities at DU for learning and critical thinking, and are seeing ABVP terror as an attack on their freedom. 1. Appropriate legal action be taken against ABVP members who indulged in violence and attacked students and teachers of Ramjas college and University of Delhi. 2. Delhi police officials who connived with the ABVP, and did not take immediate and appropriate action be punished. 3. Authorities of the University of Delhi, Ramjas College and all other colleges of DU must provide a secure environment for learning and questioning, holding extra-curricular activities like seminars on all issues, and for all students and teachers to express their opinions and organise without fear.